Accessories are one of those things I can never get enough of. I could wear the same ripped boyfriend jeans and white tee but add in a fun bag and shades and my look changes completely. Lately I find I am impulse buying sunglasses on the regular and my fav of the moment are all types of aviators. I am excited to partner with Sunglass Hut today to share my fav pair of Versace aviators and a fun contest they are doing. The contest lasts from April 21-25. All you need to do it stop by any Sunglass Hut store and instagram a selfie of you wearing a pair with the hashtag #SGHSELFIE for a chance to win a $500 gift card to the store. I mean, kind of major for the sunglass obsessed. Hope you are able to enter. They have so much good stuff right now. Good luck! For full contest details, head here and I will be announcing a winner on instagram April 26th. rhiannon - gorgeous look! you look so stunning!! Karen - Dressing in Labels - your sunglasses look great! Natali - Absolutely fabulous shoes and coat!! Sofia - Great black and white look on you. Alexandra Aimee - Love the black and white giraffe print paired with the sheer top! Subtle but very fashionable. FREED MODE - Gorgeous look, really nice this shoes and vest. The Fashion Brook - Great jacket! You look gorgeous! nat - love your chanel shoes! vera - Very pretty! I love the top! 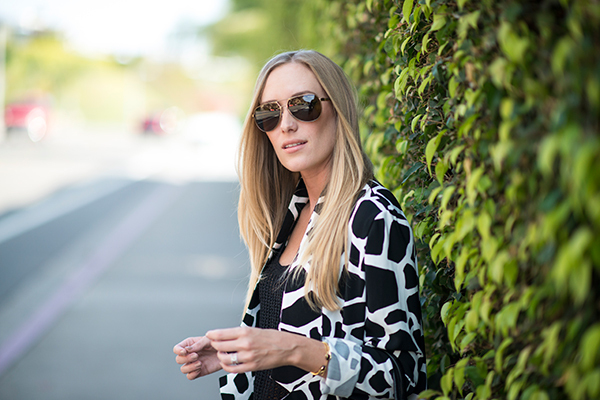 Fashion Musings Diary - Great jacket and sunnies! ReCreandome - Love your outfit, I like de print animal coat, and the transparent touch of the top. Huyen - I am in love with that blazer, the pattern is amazing! Sasha - You look gorgeous! Maggie - I love that jacket! Those shoes are perfection! Azu - Thanks for the contest! Sunglass Hut always has at least a few pairs of sunglasses that I love. Love the outfit, Kim. I want that top! Fortune Tarantola - Love this blazer! Such a urban spin on the simple black & white. Also love the sunnies & hope I get a chance to stop by Sunglass Hut!